Google Chromebook: Is it worth your $500? The desktop market is at the precipice of change as Google recently announced their brand new laptop computer named Chromebook. The browser-based notebook stacks up very well against most of the modern netbooks and tablets as well. However, is a simple web-based laptop worth your 500 bucks? Wouldn’t it be better if you buy an iPad instead? Let’s look at why you should be buying the Chromebook and why you shouldn’t. Firefox 3 was pretty much ruling the web browser market until this little devil called Chrome came along. Initially, people were hesitant to try out a new browser. However, as news about its speed spread, Chrome quickly caught up with its competitors. There are 3 reasons people choose Google Chrome over Firefox, Safari, Opera and IE: speed, speed and speed. If you’ve tried out Google Chrome browser before and were awed by its remarkable speed, then Chromebook maybe worth your buck. Google Chrome OS, the operating system on which Chromebook runs, is a zillion times secure than Windows; well, at least for now. There is an extremely slim chance of viruses affecting the system as, technically speaking; there is no operating system in the Chromebook. It’s just a browser and the hardware doing all the magic. However, one can’t be completely sure about malwares affecting the OS as hackers might find a way into the Chrome app store. Let’s hope Google remains vigilant from the start. If you’ve ever used Windows, you might be familiar with the terrible feeling you get when you lose all your data when formatting. Yes, we’ve all been there. However, Chromebook gets rid of that problem once and for all by putting the entire data on the cloud. This makes sure that no matter wherever you are all your data is there for you instantly. Google’s app ecosystem is one of the most lucrative platforms for developers. Android itself has attracted many developers thanks to their less restrictive policies. And, with Google Chrome, the number of applications for the ‘Made in Googleland’ devices is just gonna go up and up. Chromebook is great for people who are always on the move. It is lightweight, portable and it stays always in sync. If you have a desktop at home and are looking for something that would compliment that, then Chromebook is your choice. If you are a full-fledged Chrome pro who knows every tiny feature and tricks that the browser ever added, then Chromebook is something that will take your Chrome addiction to the next level. If the web is all you use on your computer, then Chromebook is made just for you. There is no need for the virus-ridden middleman that sits between you and the web browser. 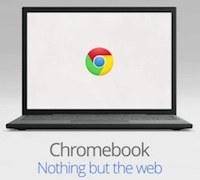 With Chromebook, it’s just you and the web. Chromebook is great if you are just browsing the web. However, what about other tasks like say basic video editing? The problem with Google Chromebook is that it does only one thing, and no matter how well it does it, it just can’t be used for tasks that are to be done on a normal computer (be it PC, Mac or Linux). There are plenty of tasks that the browser-based computer won’t be able to perform. Thus, you can’t completely rely on it, no matter how Google markets it. Although Google is way nicer than Microsoft or Apple, trusting Google completely with almost all your personal data seems a bit difficult. Google has not been the best company when it comes to safeguarding users’ privacy. Moreover, one can’t rule out the possibility of a Google employee looking at your private data. So, if you are a privacy paranoid, don't get a Chromebook and invest in a decent netbook or laptop computer with Linux pre-installed instead. As mentioned before, Chromebook stores all the users’ data in the cloud. While this may seem like the next big thing, it’s not without its share of problems. To start with, the cloud may run into a variety of problems, like a hacker attack or something worse. And sometimes, the cloud may face downtime like Gmail did so many times, no one knows. Though many of these things might not happen, one can never be 100% sure about their data on the cloud. You have your meticulously curated 100 GB music collection sitting somewhere safe in your hard drive. You’ve even made a back up of it on an external disk. Now, when you open your shiny new Chromebook, it turns out you can’t perform your daily head-banging rituals with it. How sad. If you love storing and accessing loads of data on your computer, Chromebook shouldn’t be on your buying list right now. If you already own a tablet computer like the iPad or Samsung Galaxy Tab, then buying a Chromebook won’t be a good investment. The same thing applies to all netbook owners who are happy with their devices. I wouldn't buy this notebook, because it's too internet dependent. Besides, like you say, Google would store all my data. It's weird how a notebook can work only through internet, one is used to transfer files from pendrives or stuff like that. What about gaming on that machine? Or compatibility with Windows applications? To me I think the 500-Dollar price is too expensive. unless storage is free, then buying this is pointless. which i highly doubt. amazon offers storage but it is not free. i believe that would be the case for anyone wanting to store anything above 2gb-4gb of storage on the "cloud". like the article says if you have 100gb of music, if you want to store in a Cloud, you would have to fork over some money. I looked at the chromebook instores and it was great. There is plenty of cloud storage and an additional 10GB is only 1 dollar. I can't wait till i get one.